Take a look at your inbox for this targeted offer from AAdvantage Dining. I almost overlooked it, but fortunately fellow traveler and AAdvantage Geek, Jage sent me a tweet about it. Thanks Jage! Looking for a reason to get together over food and drinks? We have 10,000 good ones! You can earn a lot of AAdvantage bonus miles with just a little extra dining out, and inviting a group to join you is the most entertaining way to earn fast. So organize an impromptu family reunion, reconnect with your pals from school or turn a handful of acquaintances into new friends over a meal. However you do it, you’ll earn! 4 Repeat up to 10 times to earn a total of 10,000 AAdvantage bonus miles! This bonus offer is by invitation only for select existing AAdvantage Dining members based on prior activity on your AAdvantage Dining account. 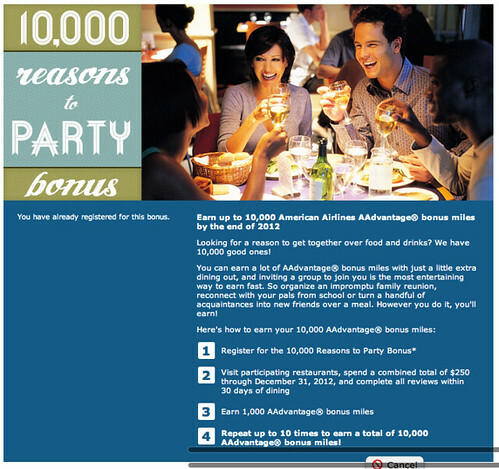 To qualify, you must be a member of the AAdvantage Dining program and register for the 10,000 Reasons to Party Bonus through the links on this page by December 31, 2012, and remain opted in to receive emails from the AAdvantage Dining program with a valid, deliverable email address. You must continue to satisfy Online and/or VIP Member level criteria to earn this bonus. Anyway, my copy of this offer ended up in a junk email folder, so keep an eye on your inbox for it. is that 1k points for every $250 i spend? so is have to spend $2500 to get all 10k miles? @ snuggliestbear @ Tracy – That’s interesting, thanks for sharing! I got an even better offer – 1.5k miles for every $250 up to 15k miles. I won’t be taking advantage of it though – there is only 1 restaurant even close to me and it isn’t even that good. Sorry for the off-topic question. I recently learned that aadvantage points no longer directly convert to hhonors points. Is there any other way to accomplish this? @ Jake – The only way I can think to do it is to transfer AAdvantage Miles to Hawaiian Airlines HawaiianMiles and then convert them to Hilton Honors points. Not sure that it’s a great value, a quick look at Points.com indicated that it takes 2,350 AA miles to equal 1,000 HawaiianMiles. HawaiianMiles convert to HH points 1 for 1, but in 5,000 mile increments (you’ll have to contact Hawaiian customer service to complete the transfer). So 11,750 AAdvantage Miles = 5,000 Hilton Honors Points. Another option you might consider is using your AAdvantage miles for a hotel award. Depending upon your plans and your situation, you might get a higher return on you miles if you go that route. I also got the 1.5k offer, but it expires on 9/30 not 12/31. I think I’d rather have the lower rewards through the end of the year.